The Rolls SX95 is a true stereo subwoofer crossover, well suited for audio enthusiasts wishing to separate low frequencies from line-level program material in any home, professional, or installed sound system without altering the original signal. The SX95 features mono or stereo operation and includes stereo RCA connectors for the inputs, pass-thru, and sub output. 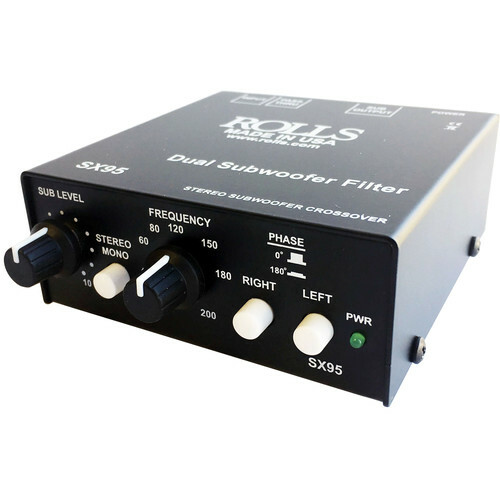 The front panel offers a stereo/mono switch, a sub level knob, a crossover frequency control knob (36 to 200 Hz), and independent left/right phase switches. The included external power supply ensures low-noise operation. Box Dimensions (LxWxH) 7.6 x 4.6 x 3.0"